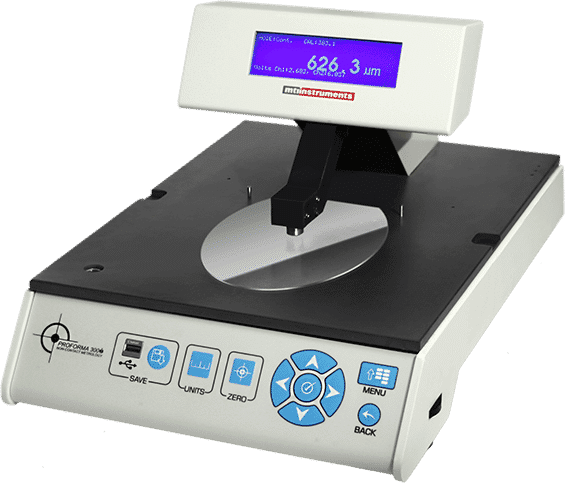 The Proforma 300i wafer thickness gage is a capacitance based, differential measurement system that performs non-contact thickness measurements of semiconducting and semi-insulating wafers. By utilizing MTI Push/Pull technology, the Proforma 300i does not require the wafers to have a consistent electrical ground resulting in exceptional accuracy and repeatability for most wafer types. The Proforma 300i system includes full remote control operating software and Ethernet network interface capability. Accurately measure 76 mm to 300 mm semiconductor wafer for TTV, thickness and bow. Cost effective manual metrology system.